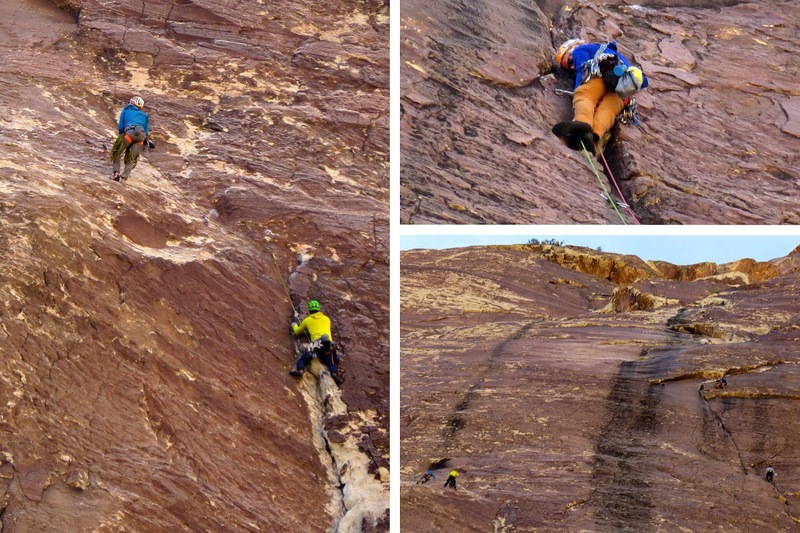 One of the longest (600') and best Red Rocks climbing routes and one of the best 5.9 routes in the world is the Epinephrine route of Black Velvet Canyon. Climbed first in 1978, this route attracts some of the best climbers for its challenges and views. 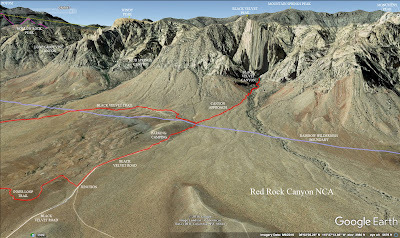 Once or twice a year, the club hikes into the canyon to watch the climbers high on the dark walls from the great scrambles in the deep wash. Today, eight hikers made the 8 mile trek starting from the Late Night Trailhead on SR 160 east of the escarpment bluffs. We started out at a moderately strenuous pace on the easy down-sloping bike trail called Mustang. This trail leaves the parking lot to the right of the kiosk. Mustang circles around the hill behind the parking lot and heads straight for Black Velvet Canyon. It crosses a desert wash and zigzags in red dirt before reaching the Black Velvet Road, a dirt gravel road that rock climbers use to make their approach to the canyon. 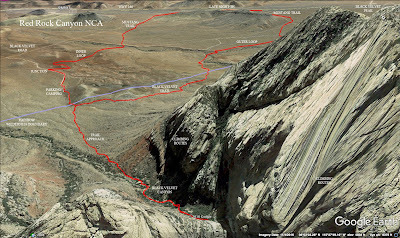 Until recently, rock climbers were allowed to car camp overnight at the end of this road. Now, the sign says that they cannot as per the rules of no camping under 5000' in elevation. Regardless, there were around 7 or 8 cars parked there and only one car appeared to have camped overnight. No one was milling about so we assumed that they were all at the wall. Our pace slowed as we hit the first rocky terrain of the morning. The main trail wiggled its way up the hill between the base of the wall on the left and the deep brushy wash on the right. A couple of off-shoots led up to the left. These paths are not as well worn as the main trail so we knew these to be climbers' routes. Our trail reached the canyon rim and climbed along the steep drop. There are the remnants of an older trail that we used to use but now, a trail that leads higher on the hill is the only safe one since the older trail has been eroded. There was a fair amount of water at the entrance to the canyon scramble. Most of it was just sitting and collecting leaves and straw in a couple of small pools. The second scramble of the wash is probably the most difficult but everyone, including the newbies, handled it like pros. After that, we began taking on each scramble one by one. The boulders are huge and after doing this scramble for several years, I kind of remember the route from year to year. If all else fails, follow the footprints or look for the most obvious place to climb! At one steep sloping rock (see photo above), we climbed it just because it looked fun. (There was another possible scramble to the left of it that we used on the descent.) The scramble fun stops when you reach a dry fall with a chock rock and an old rotting rope hanging from beneath. 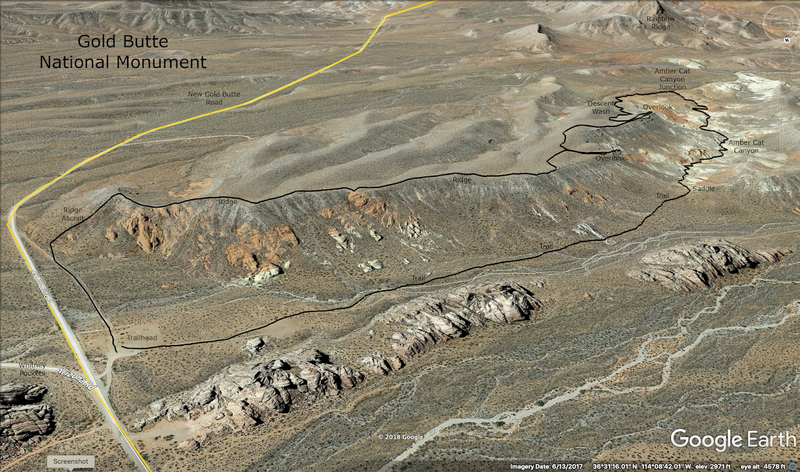 Others who really want to go further up canyon can climb the sloped wall to the south of this area. Here, we ate our snack and watched the climbers some more while marveling at their choice of sport! Close-up photos of the climbers showed calm but tense slow decisions being made. It seems that this sport is very cerebral. Arm and hand strength appears to be a must. And, a desire for some pretty crazy views! After the break, we started down. Going down the way you come up isn't as easy as it sounds since everything looks different from the top side! We weaved our way down the wash with modest pinache. 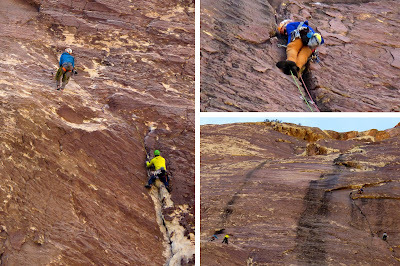 Just enough scrambling to make a seldom scrambler sore the next day! At the exit of the canyon, we collected our stashed hiking sticks and found the trail we came in on to retrace our steps back out into the cholla / rock garden on the hill. The rocky trail finally subsided when we passed the rock climbers' wag bag station. 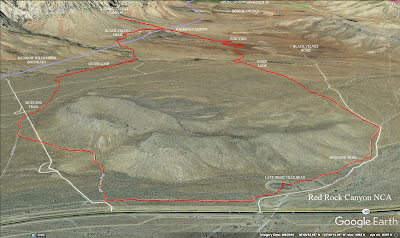 The next right turn put us on the Black Velvet Trail that started us back toward the Late Night Trailhead. 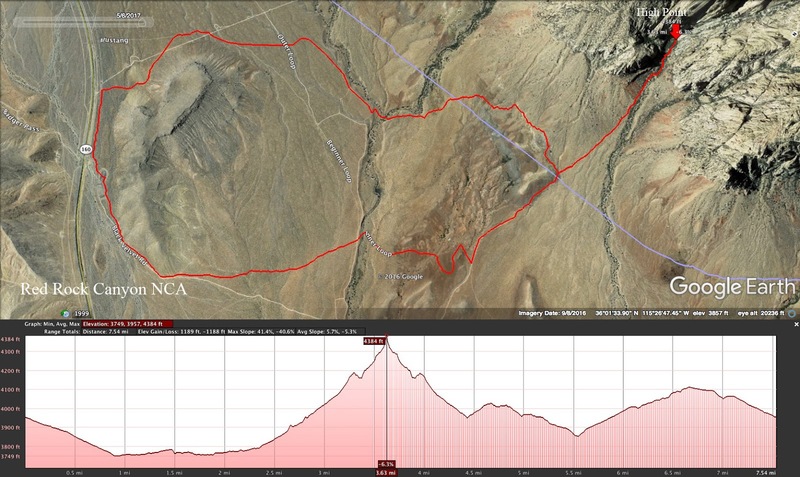 The stretch of trail from here to the Outer Loop junction is beautiful with escarpment views, rocks, chollas, layering and Mike's Rock (a large pyramid shaped rock that Mike has climbed many times!). Just before the junction, we crossed a large wash where the Muddy Springs and Grapevine Canyon washes come together. 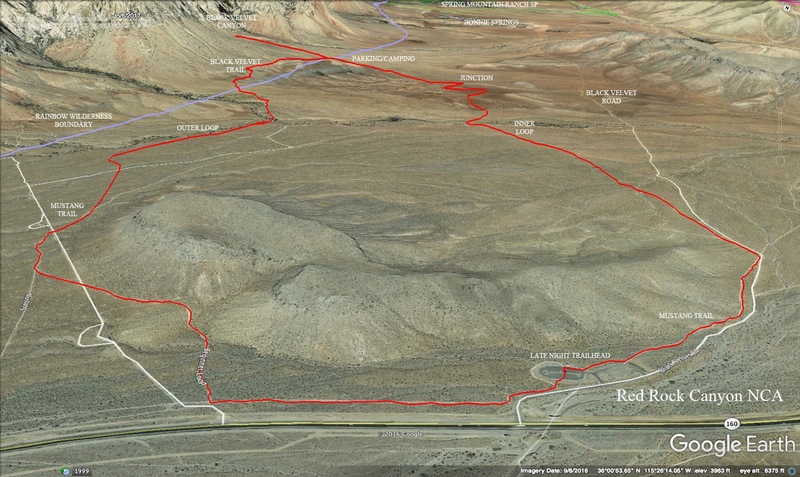 On the Outer Loop, we turned right then took a less clear trail at the next left fork. This trail led us across to join the Mustang Trail again on the west side of its loop. We only saw one biker and one runner this morning. Both were met on the return to the cars. To be fair, this was not an Around the Bend Friends hike. 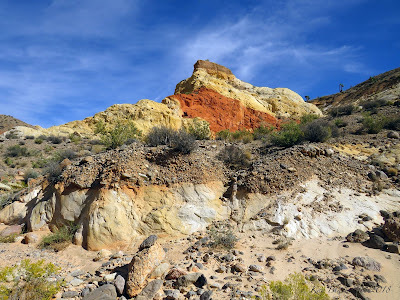 However, I attended the hike that was offered by the Friends of Gold Butte, led by Tom Cluff, to learn more about this area to add to our club's Gold Butte repertoire. 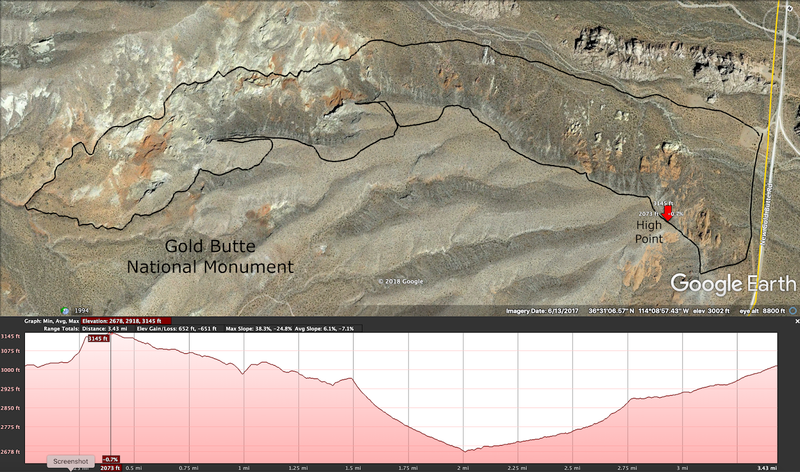 It isn't a difficult hike and it is very easy to get to in comparison to our other hikes in the National Monument. 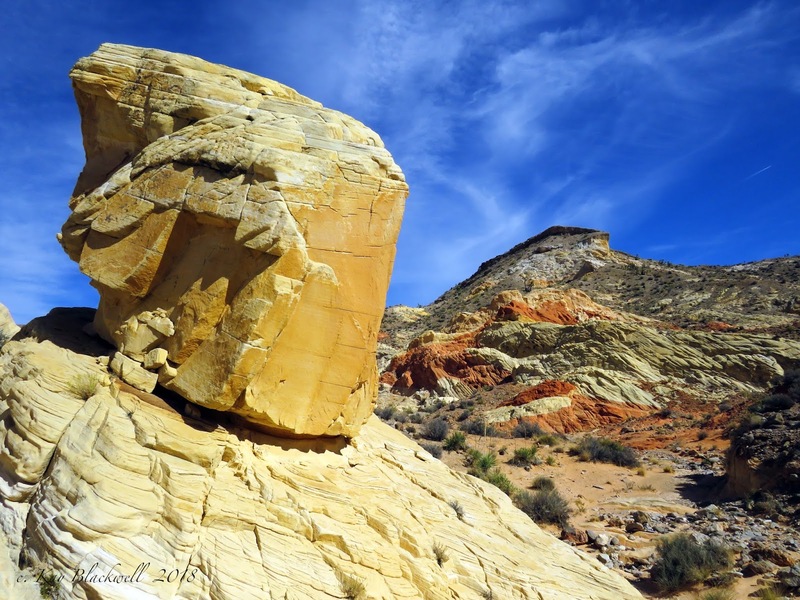 But, the reward outshines its simplicity in colors and formations in the Aztec Sandstone of the Wilson Thrust and Gold Butte Fault, the original home of Frenchman Mountain before it traveled its way to its present location east of Las Vegas. The Friends of Gold Butte hikers were all very hospitable and happy to show the newcomer their national monument of which they are very proud ... and should be. 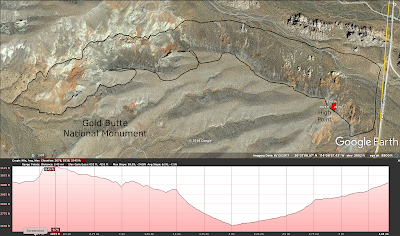 Gold Butte NM is a treasure and plans are being made as we speak for trails, campgrounds, toilets, etc. This, however, will not be happening soon. There are a lot of things to figure out to preserve the archeological sites, the ground water, the geology, etc. 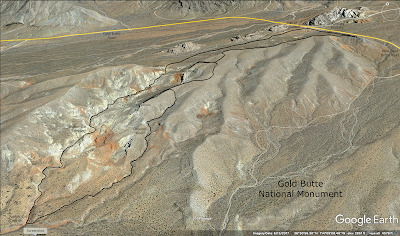 The name Gold Butte is taken from the ghost mining camp of that name that is located at the base of (Gold Butte Peak). 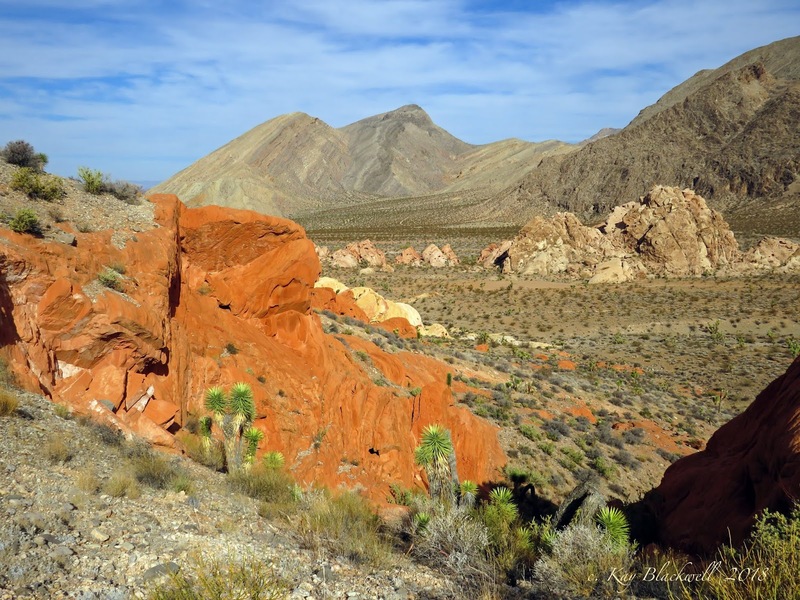 Daniel Bonelli, an early Mormon settler in the Virgin Valley, prospected in this area and in 1872 found a deposit of sheet mica near what is now Bonelli Peak, but little came of the discovery. The town of Gold Butte sprang up around 1905 following nearby discoveries of small gold-bearing veins. Another small-scale boom developed when more gold, and also copper, was found in 1908. The deposits were small and the town eventually faded away, but gold was still being mined at the Lakeshore Mine as late as 1941, and a few gold placer operations have been active in recent years. 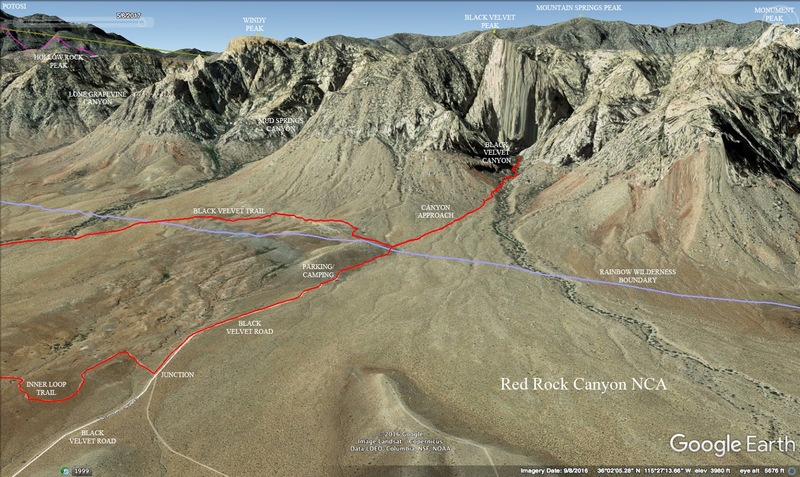 Geologic Tours in the Las Vegas Area (Expanded Edition with GPS Coordinates), Nevada Bureau of Mines and Geology Special Publication 16, University of Nevada, Reno, Mackay School of Earth Sciences, 2008, Bear Printing, Sparks, NV; pages 78. So, we left the trailhead hiking on an old road that leaves on the top side of the large parking area and headed for a fairly gentle slope that would take us up to the top of the ridge to our right. Dubbed Raven Ridge because of a nesting Raven in the area, this ridge is narrow for a short distance as it unfolds above the trailhead and heads to Amber Cat Canyon. 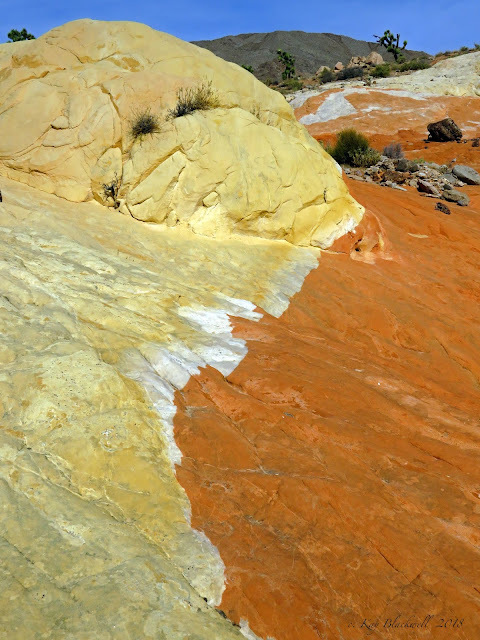 We followed the natural curve of the ridge and the view of the colorful canyon appeared. Oohing and Ahhing was heard emanating from several hikers. It is quite a beautiful sight. Beyond the canyon, we saw Black Butte, Bitter Ridge, Lake Mead and the Valley of Fire. We spent a lot of time wandering around on the connecting ridges taking several photos. Caution #1: While wandering, care must be taken to not destroy the cryptobiotic soil atop the ridge. Caution #2: Stay off of the edge of the ridge since the soil may not be solid beneath your feet. At our first big overlook spot, we saw the Island in the middle of the canyon below for the first time. Then after a second big overlook, we dipped down into one of the washes that the connecting ridges made. Gently, this small sandy wash led us down into the depths of the color. On the way, we passed a mud wall that contained fossilized roots from ancient plants. It was a nice surprise for all of us. Eventually, we came to a T junction. 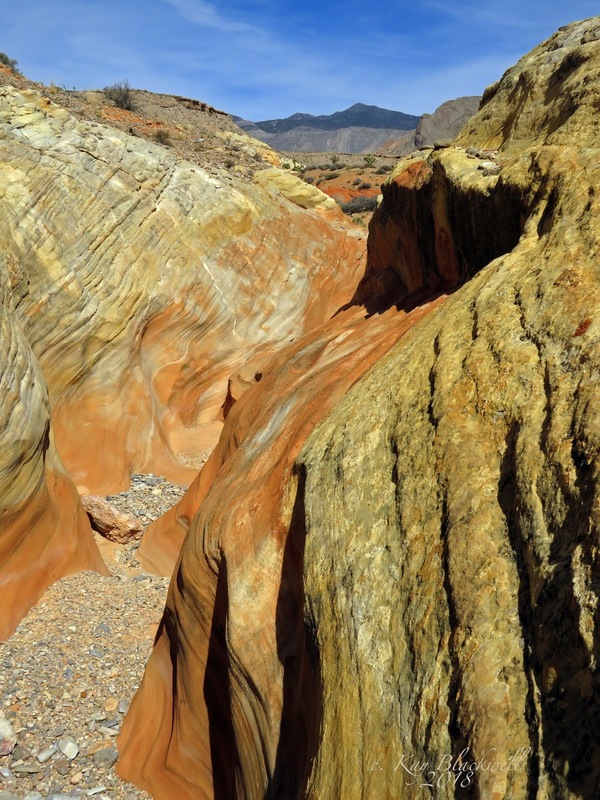 This was the Amber Cat Canyon wash that we found! Finally at a good place to sit, we had our snack break while we puzzled over a particular yellow flowering plant. The sand in the wash was still wrinkled from a storm that drenched the area not even a week ago. We were the first to place footprints in the complicated designs and textures. The break was leisurely then we rose to continue. A right turn put us on a path to ascend the gentle wash that led us into small slots, some of which were difficult to walk in due to the narrowness of the floor between the two rock sides. So many colors! 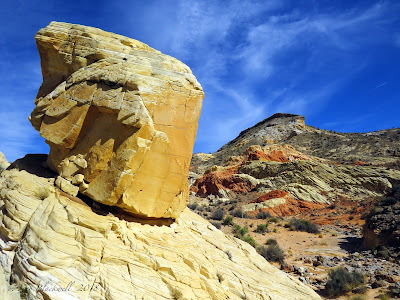 But, the amazing thing is that the amber colored sandstone was sooo so amber! 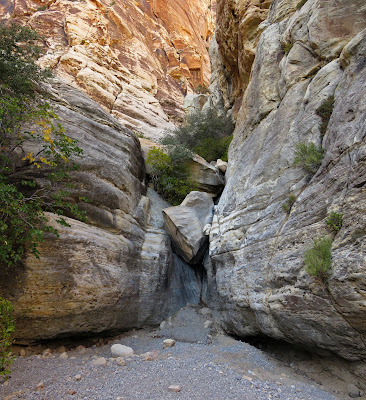 The first part of the canyon from our snack point junction was like this, small slotty sandstone. Fun to hike and beautiful to see. The slots slowly became a little bigger and they reminded me of the small slots in the Kaolin Wash of Valley of Fire State Park. In fact, the Valley of Fire and this area of Gold Butte are sisters in their creation! The slots opened out but the different textures remained a focal point. We wound and wiggled through the wash until the Island came into view. It looks much bigger from the bottom of the canyon than it did from that first overlook. And, it is very colorful! The Island has a large empty bird's nest on its upper wash corner and is topped by the limestone / dolomite conglomerate that is also found on top of the ridge. Interestingly, the top of the Island is much lower than the ridge elevation. Hmmm. It took a while to hike up to the Island and pass it. So many photos had to be taken! Also in this immediate area, we passed a white and amber rock formation that looked suspiciously like a rabbit ... or a tortoise? ... no, it's a cat! I get it! Amber Cat! The slots continued in various shapes and forms and depths. We were in no hurry! The next point of interest ... and we still had not passed the Island ... is a humongous white monolithic boulder on the left side of the wash. My husband hates the photo (below) for it being to "garish." Hm. Well, I kind of like it. What do you think? Makes a statement, huh? So, the next few hundred yards was filled with photos of the Island as we made our approach then passed it. Just a few more wash wiggles and we were climbing up the end of the canyon wash onto the saddle above. Here, we gathered for a group photo then found the trail that would take us to the cars. The trail is very clear here so it is good to walk only on the path so as to not disturb any of the vegetation or crypto nearby. The trail follows along the ridge where we had hiked in the beginning. 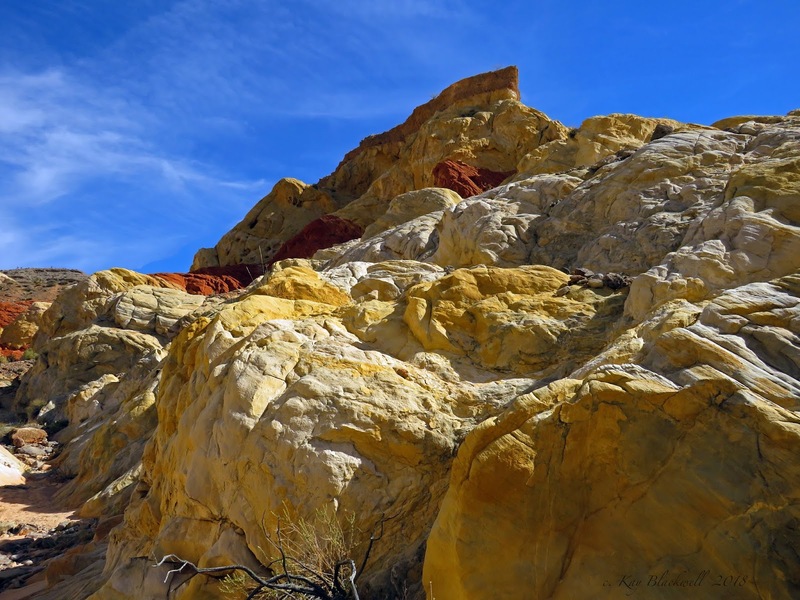 Also, along this ridge wall, there were sandstone colors and formations. One thought: Someday ... someday ... this valley trail will have eroded down to more of the colorful sandstone that lies under the soil. And, probably, will go all the way from Black Butte to Whitney Wash. I would like to be able to see that! It was a great day with the Friends of Gold Butte! I would like to join them for more hikes. It is a great way to learn more about this area's geological and cultured past. ... Not to mention new routes! We love new stuff!